A rare behind-the-scenes glimpse at a classic 1960s film has been uncovered in a garage in Lincolnshire. The 16mm film about the making of Zulu was discovered by Dr Jay Pinto, a GP from Sleaford who collects films in his spare time. It shows actors relaxing off-set and arriving to make the film, which was shot on location in South Africa in 1964. It will now be used as the basis for a documentary about the making of Zulu. 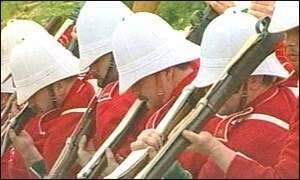 It depicts an event in 1879 at Rorke's Drift when a force of 139 British soldiers successfully fought off an attack by over 4,500 Zulu warriors. Zulu was the film which launched the career of British actor Michael Caine. It immortalised the exploits of the soldiers, many of them Welsh, from the 2nd Battalion, 24th Regiment of Foot. Nothing is known about who filmed the footage. "The film starts with scenes from about two weeks before the British actors arrived at Cape Town airport," he said. "This is a one and only - there is no copy of this anywhere in the world." Dr Pinto has shown it to film experts from Sheffield University. "There are plans to make a documentary about the making of Zulu and this will be an essential part of it." Dr Pinto also plans a special showing in Sleaford. The movie enthusiast said he did not know if he would sell the unique footage, but believed it must be well cared for. "The film needs to be kept in an archive, that's for sure. "In my little house the conditions are not optimal and the film will deteriorate." But the biggest unanswered question is how the film came to be stored in a garage? Dr Pinto said: "Why did the film get lost? "Why could I buy it in a garage bemuses me."